When I casually suggested we buy one of Tunisia's ubiquitous scooters, Tara couldn't stop laughing. The thought of us zipping down the road in the middle of the desert on a crappy little moped was, in her words, "perfect". 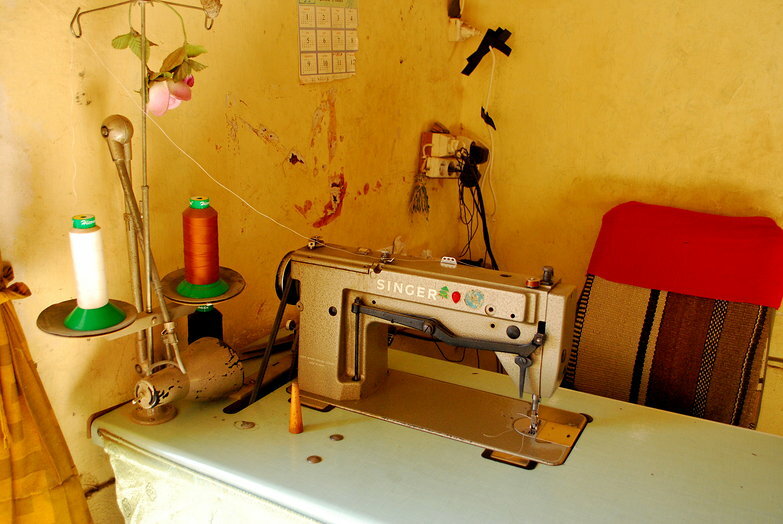 Though we've been able to quickly and effectively dash around the country from place to place via louage, we've just been moving from one population center and its "must see" sights to the next. It has been a great change of pace but it is decidedly not what we started this adventure to do. We want to see the land and be a part of the countries we travel through, not just visit the cities and attractions within. We'd considered purchasing old bicycles a few times but decided against it in favor of a) trying a new style of travel, and b) covering ground a little more quickly until our wheels arrive. We agreed a moped would be a perfect compromise, assuming of course that my idea worked as planned and it didn't completely fall apart! So, this morning we left our hotel bright and early to see a man about a scooter. Somehow or another we never got his name; from here on out I will refer to him as "Frank". At the suggestion of Frank and his friends, we made our way to an insurance agency located on the second floor of a pharmacy just a few blocks from our hotel. The kind, matter-of-fact salesperson behind the desk informed us that scooter coverage was 80 TND per year, and was only available for that duration. Other than the payment itself, we needed only to bring a photocopy of my ID and a receipt for the purchase of our scooter. With our next move planned, we left the agency to get a bill of sale from Frank. When we arrived back at the lumber shop where he worked, Tara tried her best to explain what we needed. Frank, who we think had never sold a vehicle, was confused. We all decided it would be best if he went with us to the agency to hear the requirements in person. When we arrived, the agent told Frank to head down the road to a small bookshop/office supply store to buy a single piece of receipt paper. He sheepishly agreed and we left to purchase one. Back at the lumber shop where Frank's Motobecane Mobylette 88 was waiting, he enlisted the help of several nearby workmen to find the VIN. Nobody knew where it was! My guess, the face of the head-tube (where it is found on many motorcycles) was wrong. We finally located it, barely visible, on the chain-stay. Then Frank didn't have a pen. 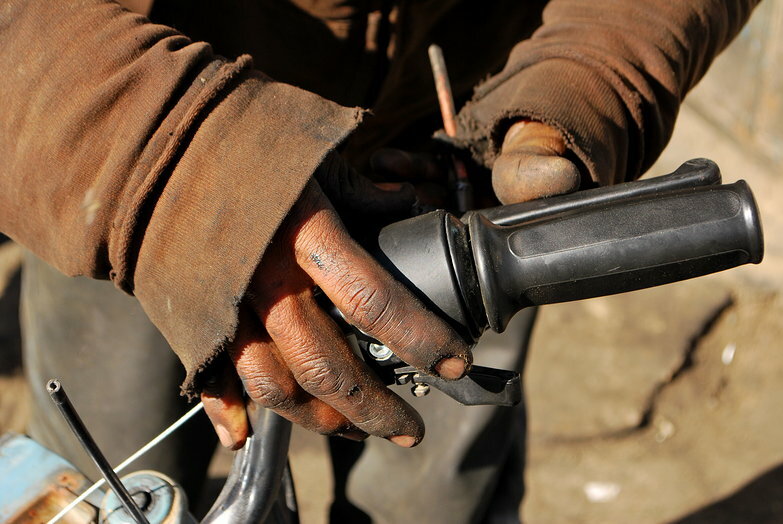 After a bit of confusion, one of the people helping fished a grimy, black object out of his grease-coated coveralls and slapped the receipt paper down on the hood of a rusted old truck. Frank shouted out the numbers one by one in Arabic while the man filled out the form with his pen. Success! We returned to the insurance office with our bill of sale. The insurance agent was surprised, thinking that we had planned to purchase a new scooter. For this sale we had to complete one more step: get an official stamp from the municipality approving the sale (we think). We were both fully prepared for a full day of waiting and misdirection so this didn't trouble us at all. Leaving the office, Frank hailed us a cab and gave the guy strict instructions to take us to what I guess could be considered the county courthouse. We took no turns and arrived less than 1km later, just a few blocks down the road. Then, the cabby tried to screw us, saying the ride was 4 dinar. This has been happening a lot lately. He hadn't turned on the meter. Tara got out of the cab and went into the courthouse, eager to avoid the task of trying to translate/negotiate with this swindler. My first reaction was to laugh derisively the absurd price, giving him an out to say he was joking and making it clear that I wasn't going to pay it. The minimum taxi fare here is 400 millime and we'd been in the vehicle for less than 5 minutes. When he didn't budge at my offer of 1 dinar, I dropped 700 millime in his outstretched hand and got out. He quickly jumped out of the cab and I walked around to confront him. He relented, saying he would take 2 dinar. I indicated that 2 dinar would be fine for both ways, gave him 300 more millime and walked away without looking back. Inside the courthouse Tara had everything arranged so all I needed to do was sign the bill of sale. 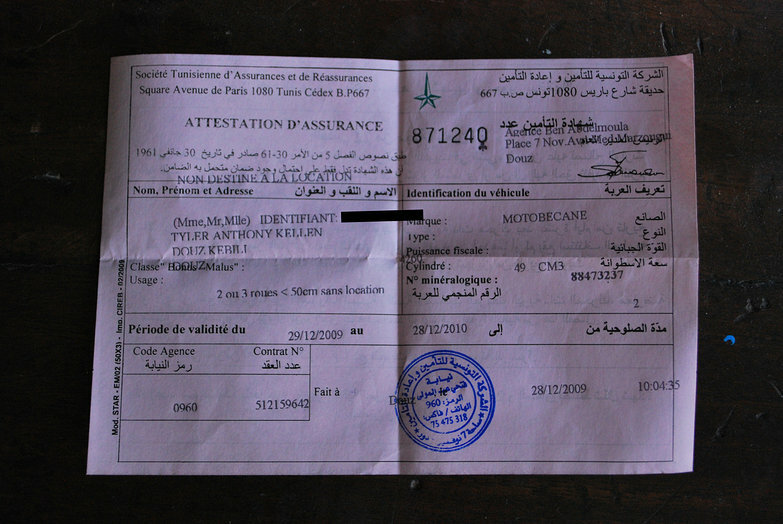 With a satisfying thunk they stamped our receipt and we were one step closer to owning our own scooter in Tunisia! Unsurprisingly, when we went outside, the taxi was gone. We walked back to the insurance office and sat on a comfortable couch while we waited for the insurance agent to prepare an official proof of insurance. When he was finished he proudly handed over the small piece of paper and wished us well. Success! Now that we were legal, we just had to make sure our two conditions were satisfied: the front brake needed repairing, and Tara needed a cushion to cover the bare metal where she would sit. The site of two foreigners purchasing a mobylette created quite a lot of attention and the news seemed to spread like wildfire. 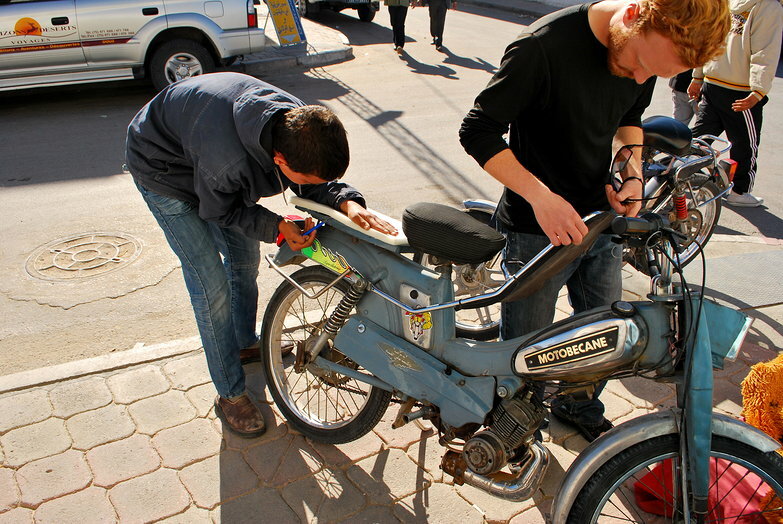 When we stopped by our hotel to drop off our jackets, the owner casually asked us how the mobylette repairs were going and where we planned on traveling with it! Outside the lumber shop, hardware store, upholstery shop, and scooter repair shop (all within a half a block of one another) everyone was curious what we had in mind. 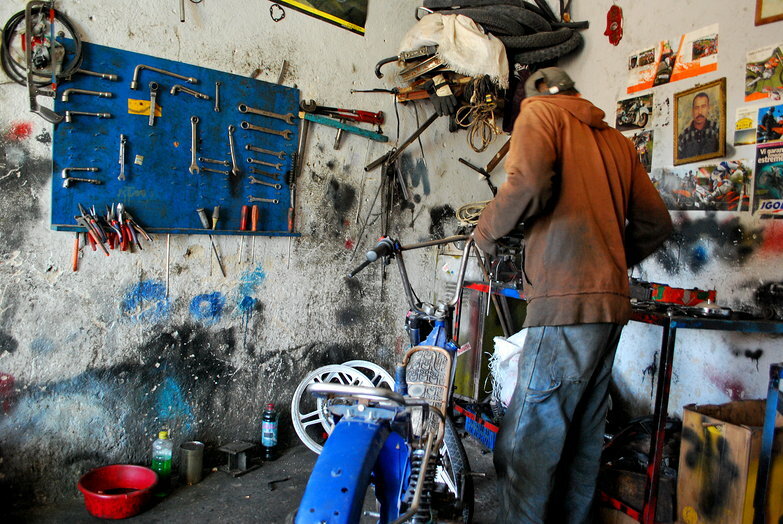 The next hour was spent in the repair shop while two mechanics tried to find a working front brake for our scooter. They must've tried five different scavenged drum assemblies before they found one that worked. They were very friendly and even treated us to a coffee while we waited. With our front brake sort of working (certainly better than not at all) our next stop was the upholstery shop seemingly run single-handedly by a 13 year old. The friendly boy took several measurements and created a padded seat for Tara in about 30 minutes! Finally, we handed over a fat wad of cash and the Motobecane was ours! 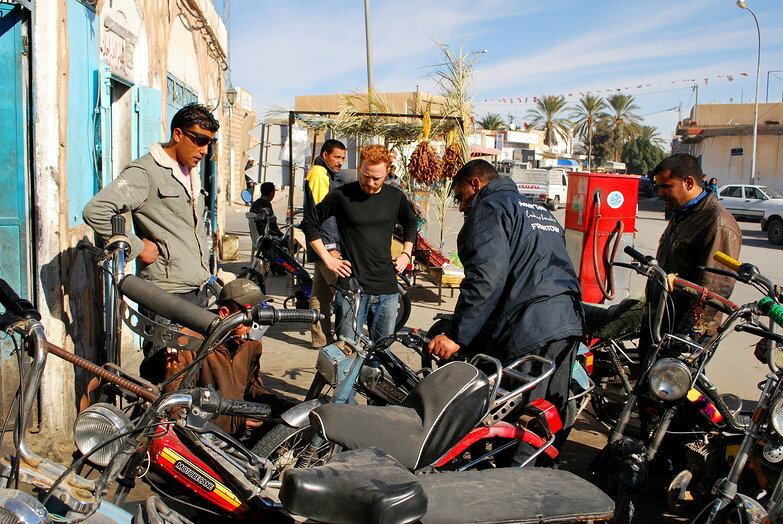 As far as complicated third-world procedures go, buying a scooter in Tunisia wasn't too bad. We rode it around town amidst cheering and staring as we got to know the newest member of our team; everyone seemed to become Italian with hand gestures and shouts of "OOOAAAHHH!" 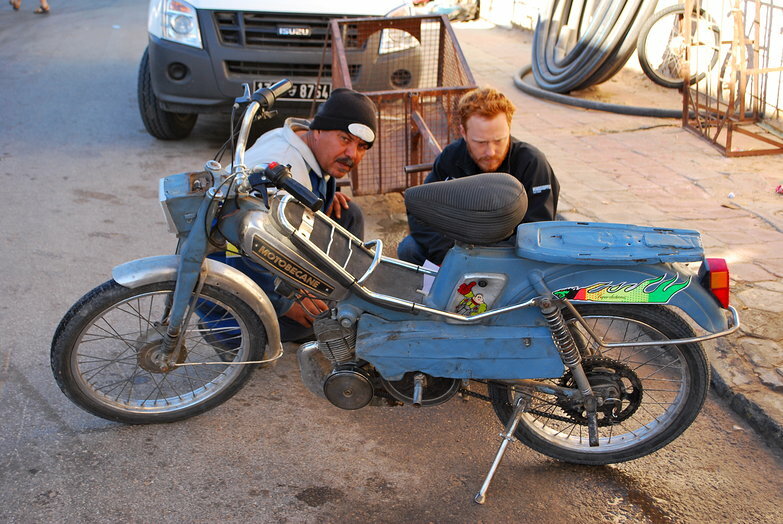 Everyone we asked said we'd paid a fair price, but no one could believe we were planning on riding it across the country to Tozeur tomorrow! Total cost for unlimited autonomous transport in Tunisia: 507 TND or roughly $390 USD (plus fuel of course). Assuming our new transport stays in one piece for the 700km or so we have planned, we're told we should be able to sell it for 200-250 TND when we leave. In a best case scenario our cost will be less than $200 USD. Not too shabby! Phenomenal! if you have any brakedowns/problems feel free to email me directly at ian.templeton@gmail.com most likely the only thing you'd have to worry about would be the carb getting dirty or the condensor failing. Don't worry, we'll be safe. I love you!